This will be the last Perfect Picture Book Friday until September. Watch for PPBF’s return in the fall! Opening Sentences: I am a backstage cat. My owner is a celebrity. I ride with her to the theater in a big, silver-grey limousine. Synopsis: Simon, a cat whose owner is the leading lady in a Broadway show, narrates the story, which is a detailed introduction to backstage told through a delightful story. Simon watches his lady get ready for the performance, and the reader sees the makeup artist working, several dressers helping her into her costume, a man with a headset calling “five minutes” – then, although she tells Simon to stay in the dressing room, he scampers out. While Simon explores, we’re introduced to the various things that are found backstage in a theater, costumes, lights, props. A loud noise causes Simon to scoot onstage and up into a prop tree. This allows us to be introduced to the stage manager, the prop person, the electrician, as well as to all that is above the stage, as they try to coax him down. His lady is finally able to soothe him with a lovely song, and he comes down… only to become involved in one final adventure before the production ends. It’s a shame there isn’t a melody given for the song, as the words are lovely, and reminded me of “Not While I’m Around” by Stephen Sondheim. Harriet Ziefert has also written a book titled Lights on Broadway, which I featured as a Perfect Picture Book pick in March of 2012. Activities/Resources: Have kids make masks (paper grocery sacks make great masks to cover the whole head) and act out the story, or make puppets from lunch bags and do the same. A great activity would be to go to a theater open house and take kids on a tour of backstage. There is an interview with the illustrator at the website of the publisher, Blue Apple Books. After reading the interview, or having it read to them, it would be fun to have kids illustrate the story in their own way. To learn more about theater, there is a great deal of information and tips at the Julie Andrews Collection website, under the heading Theater Wisdom. Availability: Readily available in hardcover, online and in independent bookstores. I guess we’re all on the same wavelength, Erik! How cool! Yes, I think you’d really like this book. Theater! Broadway! how wonderful! And backstage is such a busy (and important) place. There’s more to a play than meets the eye… as my kid would say – he loved being stage crew for school plays. I love your book-stretcher activities, too. Thanks for sharing. Thanks, Sue! A lot of people don’t realize what a hive of activity “backstage” is! Your son was right, there’s a LOT more to a play than meets the eye! Brilliant idea for a book. Bet you wished you’d thought of this one. 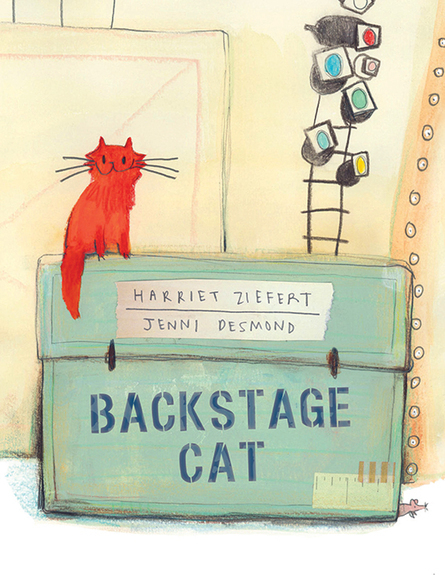 What a great way to talk about the theater and what goes on behind the scenes than through the eyes of a cat. Great choice! I’ll need to grab this one for my daughter, who is in a musical for the first time next weekend. Have a lovely summer, Beth. I’m sure I will see you around! Oh, this would be great for your daughter. Hope she has a great time in the musical! Oh, my! I immediately wanted to read this book just from the title. Sounds super fun. It’s on my library list. Thanks, Beth. My PPB was about kitties this week. Oh good — hope you enjoy it, Laura! I must see the kitty book you chose! I love the idea of slinking around backstage. What a neat pb. What a neat book, I love looking around back stage. Reminded me of my visit to Sag Harbour Theatre. Thanks, Beth. Thanks, Diane. Backstage is a fascinating place to be! Man, that Harriet makes good books! As Patricia says above — WHY DIDN’T I THINK OF THAT! Brilliant concept. Putting both of these on my list right now. Just wrote a theater poem recently about the unsung flyman. Hm, coupled with my “Opening Night” poem, maybe I have a collection in progress! 🙂 Thanks for this post, Beth. Got my wheels turning. You’re going to love these books, Renee! Oooooooh, that’s definitely a poetry collection I would love! Keep at it! This looks like a great find, Beth! Thanks for pointing it out to us. You’re welcome, Wendy! I’m delighted with it. Just the cat’s happy expression draws me in! Simon look so cheerful. What a great kid-friendly way to introduce children to backstage life. Yes, isn’t he a delightfully cheerful looking cat? I think kids will love this. What a perfect book for you to review! I read this book a while ago and loved it. The illustrations are the perfect style for the story. Great choice! Oh how wonderful to hear from someone else who has read and loved this one! Thanks, Genevieve! Oh! I have to get this book for my kids. I think we are all going to love it. And what sweet illustrations! I really enjoyed your activities for this book. Thanks. Have a great summer! Thanks, Joanne! I hope you enjoy the book, and have a great summer as well! I am a fan of Ms Ziefert. She has done some really fun books. This one looks great. Even if it’s a cat. I like to get the inside scoop from unlikely sources. I’ll have to check this one out! Thanks!